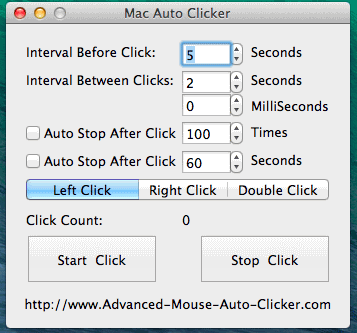 Mac Auto Clicker is a powerful yet easy-to-use tool with many more features that can free your hands and save your time.Mac Auto Clicker is a Mouse Automation Utility which can be used to Click at existing Mouse Cursor Location any number of times. Support set interval before click. Support set interval between clicks. Support automate stop after clickers. Support automate stop after time.